The movie follows a group of high-school students whose classes are abruptly ended when one of them (Timothy Miller) attacks a professor (played by director Steven C. Miller). Three friends: Chris (Garrett Jones), Scott (William Howard Bowman) and Tim (Rowan Bousaid), take advantage of the early dismissal to check out one of their favorite bands, which is appearing at a small bar in the city. At the same time, Chris' girlfriend, Jackie (Juliet Reeves), heads off with her friends to a neighborhood party. Before the night is out, however, they'll all be running for their lives, with an ever-growing army of bloodthirsty zombies hot on their trail. 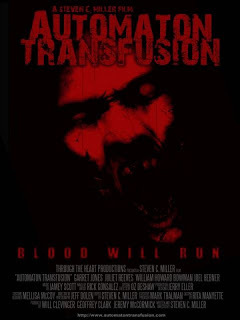 The makers of Automaton Transfusion definitely got their $50,000 worth in the bloodshed department, pulling off some amazing gore sequences that get underway almost immediately. During a pre-title scene, a hospital orderly named Charles (Chrish Shepardson) is sweeping out the morgue when he hears a series of loud thuds coming from inside one of the drawers, where the remains of a recent murder victim (Kyle Safieh) reside. Frightened out of his mind, Charles slowly makes his way over to the drawer, then cautiously opens it, revealing (yep...you guessed it), a zombie lying inside, just waiting for a fresh throat to chomp down on. But this zombie does more than simply tear at Charles' neck; it snaps him in half at the waist! It's the first of many well-executed, not to mention over-the-top, kill scenes, and it isn't even the craziest (that distinction must go to the zombie who attacks a pregnant girl. For fear of spoilers, I won't say anything more, but trust me...you'll know the scene I'm talking about when you see it). To be sure, there are moments when Automaton Transfusion stumbles: the story is rushed along, never really giving us a sense of where the zombie outbreak started, and the number of 'infected' seems to multiply with no real rhyme or reason, growing from a handful to hundreds in a very short period of time. Probably most frustrating of all is the ending, which is basically no ending at all, just a lead-in to a proposed sequel. Now, admittedly, these are some serious issues, any one of which might cripple a film on its own. But with Automaton Transfusion, the kill scenes are just too damn creative to allow little things like structure and flow to get the better of it. whatis this annoncment on planut macaber docter? epic wint south dus not surpise me i wood put munny on it the smuk mortis guy had sumthing to do wit it. souded lik a musteak passing the torch. detals docter if you can? We will have an "official" announcement that'll post on the Planet Macabre website on Sunday morning, but if you've been following the Epic Horror web site (and the complete absence of any new content on it), I suppose you can kinda guess, at least in part, the nature of the announcement! I've actually been in daily contact with Billchete, and needless to say, the news on Sunday will make a great many fans of Planet Macabre VERY happy! I do apologize that I can't say more, but I really don't want to steal any of the thunder from Sunday's announcement. Thanks again for stopping by, and for listening to Planet Macabre! A zombie film I am buying it! I think the title is kool! Waiting with baited breath on this announcement sir! It seems forever waiting. Thank you a whole lot for the fan(ME)episode. Glazing over the comments on the last week of movies makes me wonder what is happening. Everything seemed so honky dory on the fan episode which apparently wasn't the case or someone majorly screwed up. Epic Horror must be a disaster is my only guess, I see nothing happening there, even though I see your name and a few other hosts under Profiles. Assuming that, I can not for the life of me think of what the big news is except that Planet Macabre remains intact. I have crazily missed the podcast and just hope for more. @Anonymous: There's certainly plenty to like in AUTOMATON TRANSFUSION, even if the film does have its weaknesses. However, for me, the good outweighs the bad. As for the announcement, it's coming soon! @Peter: With regards to the fan episode, no need to thank us. You, and all the fans like you, are the reason the show existed in the first place. As for the situation, I can honestly say that, at the time the last show was recorded, everything WAS honky-dory. Obviously, a few things have changed since then (isn't it amazing how quickly it can happen? I mean, it's only been 2 WEEKS!). That said, the only thing preventing me from calling Epic Horror a "thing of the past" is that it never got the chance to even HAVE a past! Short of revealing anything here, let me say that, in my opinion, this announcement is BETTER than the continuation of Planet Macabre! I'm sure for the show's devoted fans these may seem like bold words, but I honestly feel you'll all agree with me once the news comes out in 3 days time. Thanks again for the comments, and for listening to Planet Macabre.